I waited a long while for this stamp set- I had the idea for picture frames some time ago but needed a stamp set with just the right faces for the picture frames. Then had to work out where the pics would be displayed —- in a mole tunnel! Watch the video below or click HERE to see it in HD on YouTube. Lots of other ideas could work here too – bird family photos in a tree, people family photos in a scrapbook, you name it! Be sure to let me know if you use this idea, I think it has legs! 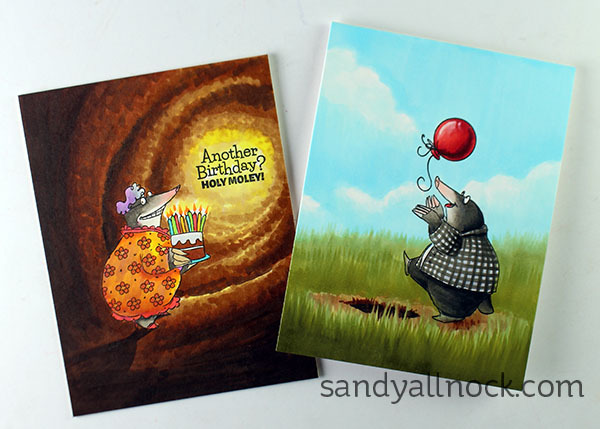 And some other colorations of this stamp set…. How cute is this family portrait ! Love this gorgeous creative card. You are such a great artist and have so much idea’s, thanks for that! 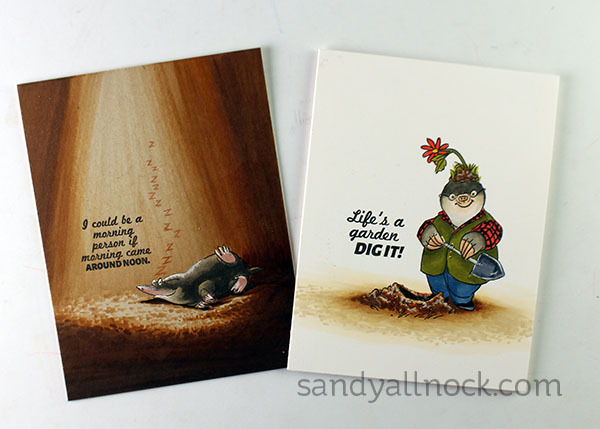 I can see you’re still having fun with the moles – I’m surprised you haven’t done a card with some Mexican moles – you know, the famous “Guacamoles”!!! Such a great, adorable, creatve card. It is like the Wind in the Willows but better! Great idea! I have some birds/owls, the chickens from the Stampin’ Up “Hey, chick!” stamp set, and a bunch of other animal stamps. Ten years ago my Cuttlebug came with four little embossing folders and a postage stamp die, so that die would be great for making some frames or vintage photographs. I can see hanging the bird frames from a tree and the chicken frames hanging from paper embossed with the chicken wire folder. I also have the stitched shapes dies from Stampin’ Up and some from MFT. Looking forward to using this idea! Wow! Great card. Love the moles and the background. Would never have though to do something like that. Love,love it. Thank you for a great video. 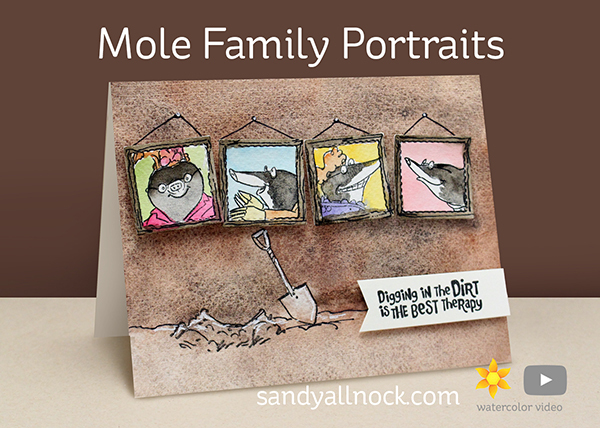 WOW this is so CUTE, would have never thought of painting a mole family haha. So cute. Who would know a mole is decorating their tunnel. Sandy, this is way too cute and funny. I not only love your sense of humour but I love your enthusiasm in making these cards and sharing them with us. Clearly you are enjoying making them as much as we are enjoying watching you create them. What a great way to start my day. Thanks for sharing! ADORE this card! What grabbed my attention before my eyes even saw what was in the frames was that glorious background. I just love browns and grey, too. But to have them in these granulated DS watercolors is over the top for me. I want to feel this and touch it and have it near me when I fall asleep! But then I saw the moles and laughed out loud. Never would I have thought I want this stamp. But now I need it. This card would also be fun to use tiny pictures of family members. My grandsons could look great pictured in a pile of dirt and no one would even wonder why I made it that way, LOL. Omigosh! That’s a riot! 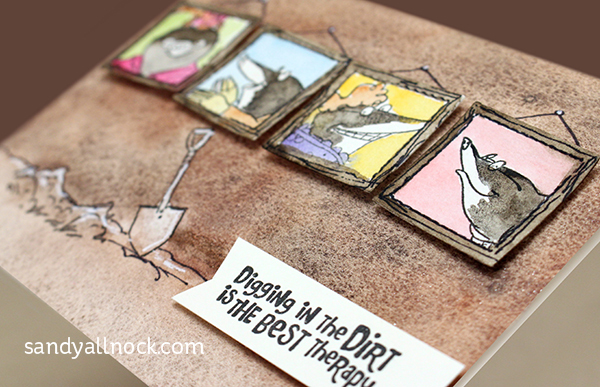 As an avid gardener, I’m not really a fan of moles, BUT I’m totally on board with this stamp set – I mean, who has more fun?! Your portrait idea is a great one – I’m thinking of things like astronauts displayed vertically or fishies displayed along the bottom of the (sea) wall… Holy Moly!!! Thanks for the first laughs of the day – you’re the best!